I don’t have the photos to prove the queue. But I could practically swear that there was such a long line at the National Museum of the Philippines yesterday. It extended from the front doors to the narrow garden beside the offices. And it didn’t look like it was moving. But I was! While I had my heart set on seeing the huge chunk of the Berlin Wall yesterday, I immediately decided to see it some other day. Better than baking under the afternoon sun. I consoled myself with the thought of just crossing the street and going to that other museum, if only to do something. The Museum of the Filipino People had far less actual people going in it. There wasn’t even a queue! I’ve never been inside it. And I could use new sights so I decidedly stepped through the door. Past the reception area, the first thing most people would notice was the Ifugao house. As much as I’d like to take photos of the interiors, it was difficult to get a whole minute to myself there because the structure attracted so many kids followed by their parents and yayas. And if you’re at that age when you still play house, you too would be likely drawn to it. With all the other exhibits at the ground floor closed, I had nowhere to go but upstairs. And I could not believe what was waiting there. There it was. Three languages told people what they were looking at: Ein teil der Berliner Mauer. Bahagi ng Pader (na Humati) sa Berlin. A Section of the Berlin Wall. At first, I couldn’t believe it. Nor could I recognize it. That was not how it was described in the reports; it was supposed to look more psychedelic than that. Then it hit me: I was looking at the back. Despite circling the almost monolith, I was still in disbelief. Why was it there? Reports kept saying that it is in the National Museum—and people, like me, would immediately be drawn to the main museum because that is basically their flagship. It’s also the building associated with the name. Guess the reports didn’t bother differentiating the National Art Gallery from the Museum of the Filipino People, despite being technically under the same office. So I went around to get a look at the front. I was happy to see “happy” there. Despite being faded and peeled, the graffiti still looked good. I searched for information about the Berlin Wall. The whole wall has been divided into 40 sections. What the Philippines has is number 22. Its dimensions are 3.65m x 1.2m. The other sections could be found in other countries. 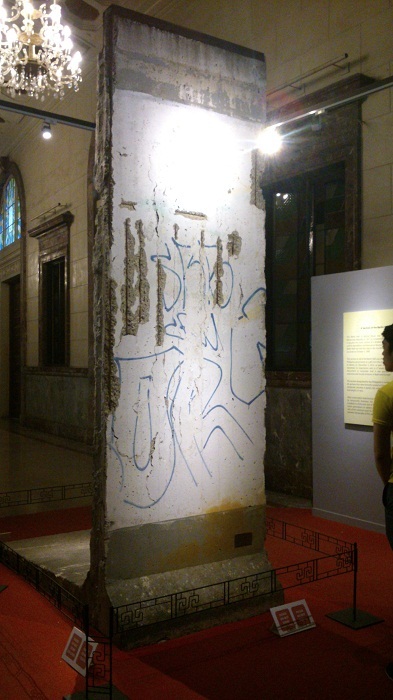 Of course, the Berlin Wall section wasn’t the only thing to see at the museum. I saw elephant tusks, religious art, information on the ivory substitutes, and models of sailing vessels. The “Treasure of the San Diego” exhibit was quite a revelation! Replicas and original pieces of jars, statues, anchors, gyroscopes, a katana, various firearms and weapons, books, and preserved plant and animal specimen were there. I also found bigger and grander clay pots, porcelain plates, chess pieces, an ink well, mortar and pestle sets, and a model of the Admiral’s Table. At the third floor, there were more recognizable pieces, which are from the people of Mindanao. The needlework was just exquisite! And the colors were refreshing and livening, after all those grays, neutrals, and rust from the floor below. The exhibit also reminded me of the legend of the Sarimanok because of the many works that featured it. One standout curiosity was what I thought was just another totem of sorts. It is huge and multicolored. It has wings, a canine head, and a serpent’s tongue. It’s called a Kokora. And its grand purpose was to grate coconuts. Another exhibit barely had visitors. And when I went around, I think I could see why. The displays weren’t as engaging. While the head-shaped jar lids were interesting, they weren’t arresting. Unfortunately, I overstayed. It was already 5PM and they were about to close the museum. So I had to leave, even though I still had to see what was at the fourth floor. Maybe I will return. And maybe not just for the Berlin Wall chunk anymore. But it’s just past 5PM! Where else could I go?